Sexual harassment at work is not acceptable. But when women make an average of 80 cents for every dollar made by a man in the same role, speaking up about sexual harassment can be difficult. That's why the issue of workplace sexual harassment is inextricably linked to the gender pay gap. Let me explain further. In a recent article from Bloomberg, I learned that "women who experience sexual harassment at work are six-and-a-half times more likely to leave their jobs compared with women who don’t, according to research by Amy Blackstone, Christopher Uggen and Heather McLaughlin." These women often transitioned to a role that paid the same or less than they were earning previously. If you're a woman who experiences sexual harassment in a low-paying job, you basically have two choices: you can stay or you can leave for another low-paying job. If you're a woman in a higher-paying job, you can stay or you can leave... for a lower-paying job, in most cases. After seeing the gender pay gap narrow from the 1970s through the 1990s, the progress made in attaining equal pay has stalled for two decades. Sexual harassment in the workplace is one of the causes for this stagnation. As women, what can we do to change the culture? If you experience sexual harassment and feel safe doing so, come forward. The number of women who have shared their stories since the recent resurgence of the #MeToo movement can offer solidarity, but I realize coming forward is still a risk. If you are able, add your voice to the growing number of women taking this risk. Share your salary with women, and ask men to share theirs as well. When I left my job a few years ago, I sent a message to a colleague who was applying for the position, letting her know I would be comfortable sharing my salary. She took me up on the offer, and I hope I gave her the confidence to negotiate for a fair, market-based salary. Give that gift to a woman who is coming along after you. If you have the privilege of financial security yet still experience gender-based wage discrimination, despite attempts to resolve the issue internally, come forward. Go public if you are able to safely do so (and I know this is not always possible). As Carrie Gracie, former China editor for the BBC, said in her eloquent resignation letter, I don't want the next "generation to have to fight this battle in the future because my generation failed to win it now." Call out discrimination of all kinds when you see it at work. Suppose you're in a meeting and someone uses a gender-specific pronoun when discussing the next hire, as in "when the next CFO is hired, he needs to..." Call that person out in a professional way. Say something like, "She or he will need to hit the ground running, regardless of whether we hire a man or a woman." Look the person in the eye, calmly and without smiling. Let them know you're not having any of it and you'll set an example for other women in your company to follow. 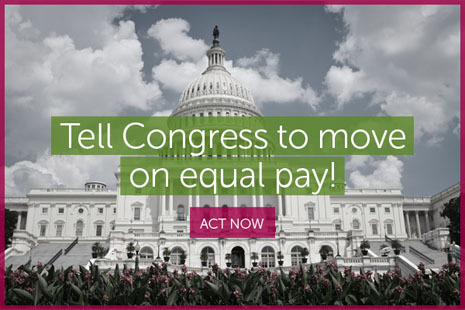 Call your senators and representative and tell them to pass the Paycheck Fairness Act (S. 819/H.R. 1869) which would strengthen penalties for equal pay violations and prohibit retaliation, as well as the Pay Equity for All Act (H.R. 2418) which would ban employers from using salary history to determine future pay. Demand a raise. Negotiate for a higher salary. Do your best to be assertive about equal pay. There are a wealth of article written about the best strategies for salary negotiation. Make a plan and then go for it! This stuff is not easy. This stuff is not comfortable or enjoyable or fun. But we--men and women in the workplace--have to get it right. Our daughters are depending on us. 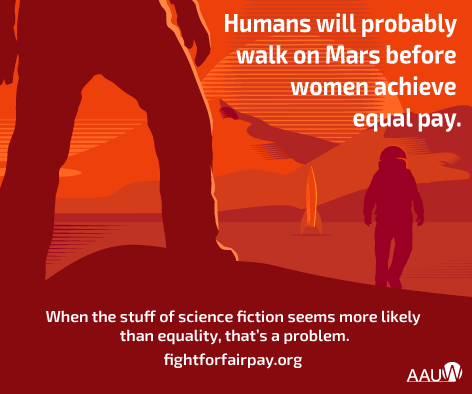 This FAQ by the American Association of University Women (AAUW) can help you counter the most common arguments that claim the pay gap is a myth. Check it out, it's good stuff. If you find their work valuable, consider becoming a member like I did a year ago! Also compliments of AAUW, see if there is a salary negotiation workshop coming up in your area. If you see one coming up near you, please share the info with every woman you know. The National Women's Law Center (NWLC) is another excellent resource for information, tools, and legislation such as the Paycheck Fairness Act. Contact me if you'd like to work with a career coach to find a better-paying job, learn to negotiate salary successfully, or explore a career transition. I deeply appreciate those in my network who share my posts! Let's lift each other up.